Shark fishing is highly successful during the warmest months of the year. Anna Maria Island and adjacent Tampa Bay are spawning grounds for many species. Capt. 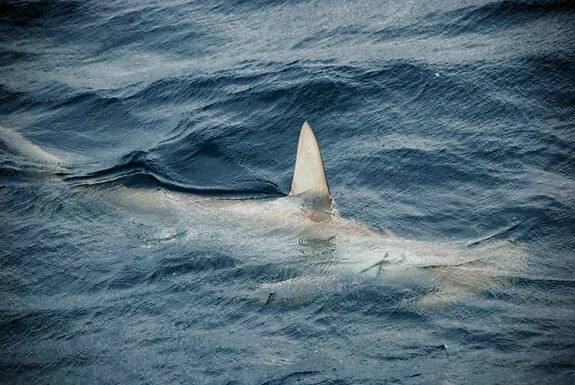 Tom Chaya reports numerous shark sightings especially during Tarpon fishing. Great hammhead sharks up to 15 feet along with 1000 pound bull sharks have intercepted many hooked tarpon. Blacktips are one of the more numerous species in Anna Maria and Longboat Keys. Pound for pound blacktip sharks are probably the scrappiest of sharks. They wage a wild battle on medium tackle, marked by long runs and lots of frantic, spinning jumps. They range from in size from 5-40 pounds and 60 pound plus is very common in the gulf. Capt. Tom Chaya of the charter boat Dolphin Dreams uses spinning gear and uses any type of cutbait for best success. Most live baits as pinfish and Thread herrings will work well. Since sharks have relatively poor eyesight, you must present the bait when sightfishing very close to fishes immediate path. Blacktip sharks are one of the best eating sharks but with overfishing of the past decades we tend to release all alive.